We can stop whatever we are doing and completely change course if we want to. My schedule for the girls has been learning about the countries of the world. Zachary is going through the alphabet. But right now we're putting a pause on all that, because of something amazing that is happening right outside our window. 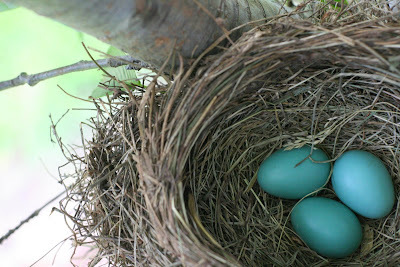 Robins have been building a nest in a tree right in front of our house. The kids can literally sit in front of the window and watch everything. And today, we found three eggs in the nest too! Can you guess what we'll be learning about for the next little bit? I'm off to madly scramble and pull together our lessons! Wish we could be there to join in on this lesson. We're going through Apologia's study on birds & insects, and this would truly fit in! What beautiful eggs!! What a learning moment! that is SO neat!! right outsidethe window so they can see everything is amazing! Those eggs are gorgeous too. I have given you a "Sisterhood" Blog Award! That's awesome. Our neighbor just recently had some birds make a nest on the wreath on their front door. They had eggs and then baby birds in there until they finally flew away and they could start using their door again! That is really great! I love that about homeschooling, too. Life just tends to present opportunities that you didn't plan. Have fun! Love your blog and all of your great ideas! 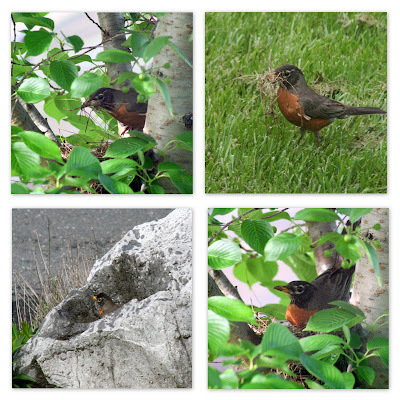 We had a robin family build a nest in our front yard last spring, and it was amazing! We did a bird unit while watching the babies grow, and the kids still remember the whole experience. P.S. I blogged about our bird studies if you're looking for ideas/books, etc. - just look under Birds in the category list.